The Global Volcanism Program has no activity reports for Harrat Ash Shamah. The Global Volcanism Program has no Weekly Reports available for Harrat Ash Shamah. The Global Volcanism Program has no Bulletin Reports available for Harrat Ash Shamah. Al Harrah, a large basaltic volcanic field in northwestern Saudi Arabia near the Jordanian border, covers an area of 15,200 km2. This field forms the southern third of the massive Harrat Ash Shamah volcanic field, which extends from Syria through Jordan into northern Saudi Arabia. The Saudi Arabian portion of the Harrat Ash Shamah extends across a 210-km-long, roughly 75-km-wide NW-SE-trending area on the NE flanks of the Wadi Sirhan and reaches its high point at Jabal al Amud. Activity began during the Miocene; a younger eruptive stage, at the SE end of the field, occurred during the late-Pleistocene and Holocene (Brown et al., 1984). Abou-Deeb J M, Otaki M M, Tarling D H, Abdeldayem A L, 1999. A palaeomagnetic study of Syrian volcanic rocks of Miocene to Holocene age. Geof Internac, 38: 17-26. Barberi F, Capaldi G, Gasperini P, Marinelli G, Santacroce R, Scandone R, Treuil M, Varet J, 1980. Recent basaltic volcanism of Jordan and its implications on the geodynamic history of the Dead Sea shear zone. Accademia Nazionale Lincei, Atti Convegni Lincei, 47: 667-683. Bender F, 1975. Geology of the Arabian Peninsula - Jordan. U S Geol Surv Prof Pap, 560-I: 1-36. Camp V E, Hooper P R, Roobol M J, White D L, 1987. The Madinah eruption, Saudi Arabia: magma mixing and simultaneous extrusion of the three basaltic chemical types. Bull Volcanol, 49: 489-508. Camp V E, Roobol M J, 1989. The Arabian continental alkali basalt province: Part I. Evolution of Harrat Rahat, Kingdom of Saudi Arabia. Geol Soc Amer Bull, 101: 71-95. De Vries H, Barendsen G W, 1954. Measurements of age by the carbon-14 technique. Nature 174:1138-1141. Ilani S, Harlavan Y, Tarawneh K, Rabba I, Weinberger R, Ibrahim K, Peltz S Stenitz G, 2001. New K-Ar ages of basalts from the Harrat Ash Shaam volcanic field in Jordan: implications for the span and duration of the upper-mantle upwelling beneath the western Arabian Plate. Geology, 29: 171-174. Krienitz M-S, Haase K M, Mezger K, Eckardt V, Shaikh-Mashail M A, 2006. Magma genesis and crustal contamination of continental intraplate lavas in northwestern Syria. Contr Mineral Petr, 151: 698-716. Krienitz M-S, Haase K M, Mezger K, Shaikh-Mashail M A, 2007. Magma genesis and mantle dynamics at the Harrat Ash Shamah volcanic field (southern Syria). J Petr, 48: 1513-1542. Mahfoud R F, Beck J N, 1995. Petrogenesis and Geodynamic Significance of Ultramafic Inclusions and Basanite from Southern Syria. International Geology Review 37:448-470. Mouty M, Delaloye M, Fontignie D, Piskin O, Wagner J-J, 1992. The volcanic activity in Syria and Lebanon between Jurassic and Actual. Schweiz Mineral Petrogr Mitt: 72: 91-105. Shaw J E, Baker J A, Menzies M A, Thirlwall M F, Ibrahim K M, 2003. Petrogenesis of the largest intraplate volcanic field on the Arabian Plate (Jordan): a mixed lithosphere-asthenosphere source activated by lithospheric extension. J Petr, 44: 1657-1679. Snyder G A, Taylor L A, Jerde E A, Sharkov Y, Laz'ko Y, Hanna S, 1993. Petrogenesis of Garnet Pyroxenite and Spinel Periodotite Xenoliths of the Tell-Danum Alkali Basalt Volcano, Harrat As Shamah, Syria. International Geology Review 35, 1104-1120. Trifonov V G, 2007. The Bible and geology: destruction of Sodom and Gomorrah. In: Piccardi L, Masse W B (eds), Myth and Geology, Geol Soc London Spec Publ, 273: 133-142. Weinstein Y, 2007. A transition from strombolian to phreatomagmatic activity induced by a lava flow damming water in a valley. J. Volcanol. Geotherm. Res., 159: 267-284. There is no Deformation History data available for Harrat Ash Shamah. There is no Emissions History data available for Harrat Ash Shamah. The Golan Heights basaltic volcanic field lies NE of Lake Tiberius (Sea of Galilee) in the Anti-Lebanon Mountains of SW Syria near the borders with Lebanon and Israel. 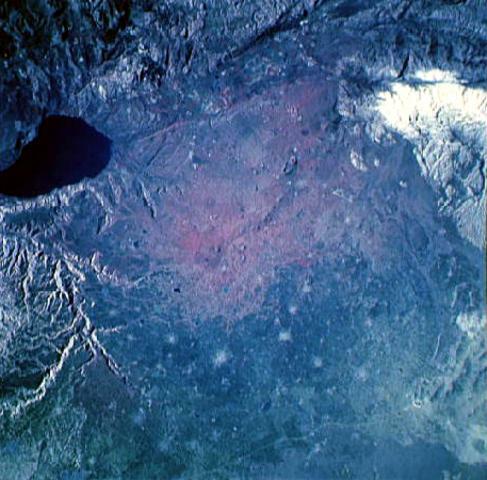 Lake Tiberius, whose surface lies below sea level, is at the upper left in this NASA Space Shuttle image (with north to the upper right). The volcanic field contains 56 cinder cones of Pliocene-to-Holocene age and includes the prehistoric cone of Majdel Shams in the Golan Heights. NASA Space Shuttle image STS060-97-24, 1994 (http://eol.jsc.nasa.gov/). The dark-colored lava flows in this NASA Space Shuttle image (with north to the left) lie at the southern end of the Es Safa volcanic field. This basaltic field (also referred to as As Safa), lies SE of the capital city of Damascas (Dimashq) and contains at least 38 cinder cones. 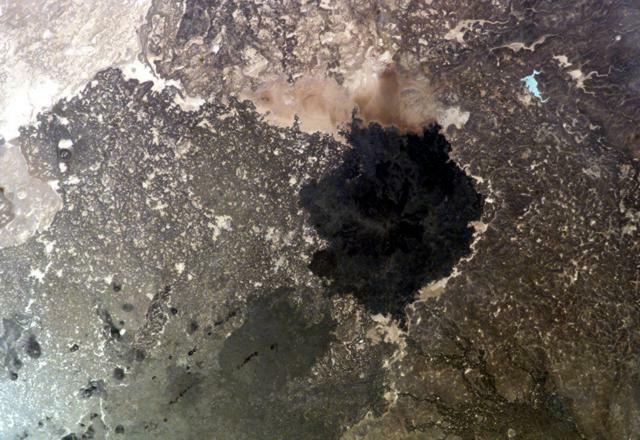 A boiling lava lake was observed in the Es Safa volcanic area in the middle of the 19th century. This volcanic field lies within the northern part of the massive alkaline Harrat Ash Shaam volcanic field that extends from southern Syria to Saudi Arabia. NASA Space Shuttle image ISS007-E-8414, 2003 (http://eol.jsc.nasa.gov/). 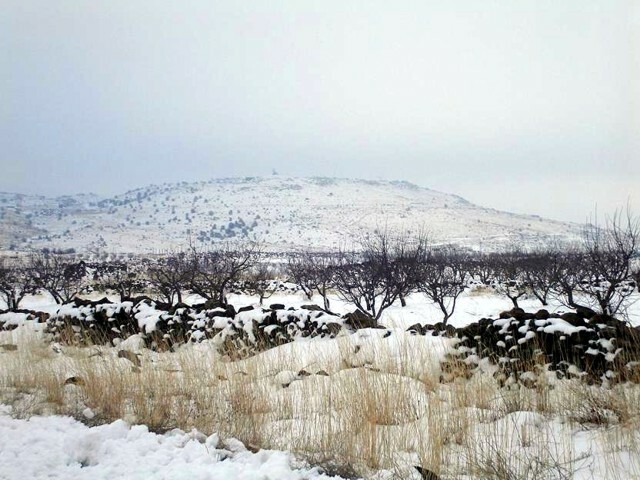 Snow-capped Tell Qeni is the highest point of the Jabal ad Druze volcanic field, the southernmost in Syria. It lies in the Haurun-Druze Plateau in SW Syria near the border with Jordan. The most prominent feature of this volcanic field is 1803-m-high Jabal ad Druze. The alkaline volcanic field consists of a group of 118 basaltic volcanoes active from the lower-Pleistocene to the Holocene. Anonymous photo by Wikipedia user KFZI310, 2006. There are no samples for Harrat Ash Shamah in the Smithsonian's NMNH Department of Mineral Sciences Rock and Ore collection. Large Eruptions of Harrat Ash Shamah Information about large Quaternary eruptions (VEI >= 4) is cataloged in the Large Magnitude Explosive Volcanic Eruptions (LaMEVE) database of the Volcano Global Risk Identification and Analysis Project (VOGRIPA).